here are only 43 days to go until the Royal Bath & West Show, and visitors have until this Friday, 19 April, to book super saver tickets and secure a £5 discount per adult. A thrilling day out for all ages, the Show has a buzzing festival vibe and an exceptional array of food and drink. Head along to the main ring to watch gravity-defying stunt bike riders or cheer on the army and local business in featured rugby matches. For festival lovers, visit the Pilton Tent – inspired by former Show President Michael Eavis - for live music, including the UK’s number one Take That tribute band Rule the World. And with the music – including the beloved Wurzels - continuing well into the evening, why not book into the Show’s campsite and enjoy a mini festival on your doorstep? As host to the British Cheese Championships and the British Cider Championships, the Show has plenty to whet your appetite, from local vegan and gluten free caterers to home-grown farm beef. There is also world class showjumping, rural crafts and livestock competitions. For a bit of adrenaline, have a go on the 4x4 off-road course, witness the daring antics of the Dorset Axemen and take a ride on the enchanting miniature railway. Of course, there is plenty of retail therapy on offer, with exhibitors ranging from country clothing and equipment to art galleries, garden centres and toy stores. Children - for the first time - can go free during the May half term, so come along and meet Tractor Ted or the impressive heavy horses. The Royal Bath & West Show will be held on 29 May – 1 June, and with over 50 hours of entertainment each day of show there really is something for everyone. Super saver tickets are on sale until 19 April. Visit www.bathandwest.com or call 0844 776 6777 to book yours. With less than 50 days to go until the Royal Bath & West Show, entries will soon be closing for competitions ranging from private driving and sheep shearing to bees and honey, cider and cheese. Entries for the very popular equine classes have been flooding in, with new competitions this year including gypsy cobs – both ridden and in-hand – a stallion class in the riding pony breeding section, and a driven team of three, four or six heavy horses. Qualifiers include the Cuddy championship for the Horse of the Year Show, the National Hunter Supreme Championship, the British Arabian Championships and the Irish Draught Horse Challenge. In the show jumping rings, some of the UK’s top riders will be hoping to qualify for the British Showjumping National Championships, the BHS Royal International Horse Show, and the Horse of the Year Show. “With more than £52,000 in prize money up for grabs, and our stunning specialist equine area, the Royal Bath & West Show is one of the most prestigious events on the equine calendar,” says head of shows Alan Lyons. Other competitions include the British Farriers & Blacksmiths Association Championship, the Apprentice Championship and classes contributing to the acclaimed Champion Blacksmith of the Year award. A short walk from the farrier pavilion is the bees and honey tent, with classes including observation hives, comb and jar honey and beeswax decorations. The general public can even get involved with the public choice awards. Having whetted their appetite, they can then head to the British Cider Championships and British Cheese Awards, to try out some of the UK’s best produce. Livestock are a key part of the South West economy, and the best dairy and beef cattle, sheep, pigs and poultry will be competing for top honours in the livestock rings. This year, new classes include the Dexter National Show; commerical cattle; Portland, Primitive and Shetland Sheep and veteran sows. “We are also hosting the Golden Shears Junior and Open Sheep Shearing Championships, attracting the best sheep shearers from across the country,” says Mr Lyons. The Royal Bath & West Show will be held on 29 May – 1 June. Competition schedules and tickets are available from the website: www.bathandwest.com or by calling 0844 776 6777. Children - for the first time - can go free during the May half term, with a £5 discount on early adult bookings. There are only 60 days to go until the Royal Bath & West Show, meaning entries will soon be closing for livestock, poultry and sheep shearing competitions. In addition, this year will see the best Dexter cattle in the country congregating for the Dexter Society National Show, while a new discipline in the Cattle Showmanship Competition will test competitors’ presentation abilities to the max - as having judged, prepared and shown, they now have to photograph their animal. A new class for veteran sows complements the veteran pig exhibitor prize, while in the poultry section there are classes for virtually every breed of large fowl, bantam, pigeon, duck, goose and turkey – and their eggs – you can think of, culminating in the Poultry Club Summer National championships. There is also an orchard competition for cider and apple producers, with entries judged on tree health, tidiness, apple crops, pruning and the environment. Winners receive industry-wide recognition and get to host an orchard walk led by an industry expert in July. Join the Easter Egg Hunt Trail at Hestercombe this Easter! Signs of spring are popping up everywhere at Hestercombe – there are daffodils in the gardens, birds chirping in the trees and ducks splashing on the pond. Mother Duck has hidden Easter eggs all around the gardens for Dotty Duckling to find, but she has been so busy hunting for them that she is going to be late for tea! Will you join the Easter Egg Hunt and help Dotty gather the last eggs and find her way back to the Pear Pond? Trail: £2 per child (includes prize) Normal admission applies, no need to book. Anyone involved in the strategic operation of a farm – regardless of whether the end product is crop or animal-based - will be aware that the processes involved in keeping the business afloat and profitable are energy-intensive. From running tractors, to tending to livestock, or keeping a crop store heated … all require significant energy input. This situation can become even more critical during the autumn and winter months, when harsh conditions make it more difficult for farmers to harvest, package and distribute produce. Add this to the challenges that come with heating rural, remote and off-grid agricultural locations (traditionally served by inefficient fuels like oil), and a farm’s energy supply can become fairly problematic. For farmers looking for a greener, cheaper and more effective off-grid fuel solution that’s reliable even in colder seasons, LPG (liquefied petroleum gas) could be an alternative. LPG has increasingly become a go-to for farmers looking to meet ongoing heating or operational needs without compromising on outputs and the quality of their end product – or becoming dependent on an expensive alternative fuel. Available in gas cylinder and bulk form, LPG provides an alternative to oil and solid fuels for off-grid agricultural use. It can be used for heating or transport in all types of farming processes, while also delivering a range of operational and environmental benefits. From dairy processing and poultry rearing right though to maintaining the perfect temperature for crop drying (or even propane enrichment of biomethane in anaerobic digestion plants), farmers have turned to LPG for its cleaner, more cost-effective and easily-controllable capabilities. Whether it be barn ventilation, lights, supplying food and water or manure handling, poultry cultivation requires a huge amount of energy. For birds and livestock, a constant heat supply is crucial to their survival – especially during colder seasons. An efficient and cleaner-burning fuel, LPG reduces the risk of contamination within livestock (through feeds and litter) – ensuring that animals are kept as safe as possible. The moisture produced by LPG heating is the perfect level to promote speedy feathering and weight gain amongst poultry. Choosing an LPG supplier with a national supply network means deliveries can be made quickly and efficiently, keeping birds warm all-year round. Maintaining constant temperatures for commercially grown plants and flowers is crucial to securing profits. When temperatures begin to drop, plants are naturally at greater risk of being damaged by frost, so it’s important to have the right heating system in place. LPG, as opposed to other off-grid options like oil, allows plant growers to benefit from a cleaner burning fuel, ensuring crops remain free from contamination. Depending on the size of the operation, farmers can also choose between an LPG gas cylinder, or bottle (which can easily be handled and lifted) and LPG gas tanks (which can be topped up automatically), meaning an energy system that delivers a constant heat supply for horticulture. When it comes to drying crops and grains, an LPG system can be a huge commodity to farmers looking to dry their produce quickly. As a highly controllable source of fuel, LPG makes for a more precise drying process, allowing farmers to maintain ideal levels of moisture without over-drying. The result is quicker drying all round, whilst also enabling farmers to preserve the quality of their crops, and ensure that the final product meets market specification. Additionally, with LPG grain drying technology, there’s the potential to recycle heated air, providing an even more efficient way to dry grain, without increasing fuel consumption. 4. Can LPG reduce your carbon footprint? For farmers looking for greener ways of working, LPG can offer environmental benefits. It’s a lower-carbon alternative to conventional fossil fuels, cutting carbon emissions by approximately 15 % compared to heating oil (and 33% compared to coal). It also doesn’t produce black carbon – which is a major contributor to climate change. As a transport fuel for tractors or other farming machinery, it’s also estimated that LPG (or propane) produces up to 24% fewer greenhouse gas emissions than gasoline, and 11% fewer emissions than diesel engines. Not only that, but the risk to the local environment is also kept to a minimum, as propane is non-toxic – providing a cleaner, greener, and cost-effective fuel solution for all kinds of farming uses. Somerset’s oldest cidermaker, Sheppy’s Cider, are celebrating multiple gold medal success at the coveted International Cider Awards. Established in 1888 and evolving consistently over time to reflect an ever-changing cider industry, the International Cider Awards aim to reward and recognise the innovation, attention to detail and hard work that goes into cider production. The judging took place over three days, covering multiple categories across sweet and dry styles. Sheppy’s beat off stiff competition from more than 182 ciders entered by 62 cider producers from 24 countries, including small and regional to multi-national manufacturers. 200 Special Edition - Tannic Cider category. Celebrating 200 years and six generations of cider making, made from a blend of the very finest traditional cider apples. Also recently voted ‘Cider of the Year’ by The Stable Bar and Restaurants chain. Classic Draught – Modern Cider category. A famous Classic Draught cider made with a carefully selected blend of Somerset’s finest traditional cider and dessert apples. Low Alcohol Classic Cider – Low Alcohol category. A beautifully light and crisp low-alcohol cider with a refreshing apple taste. The cider delivers the same flavour profile as its traditional cider, but with less alcohol. The accolades are of particular importance to Sheppy’s as they are the modern equivalent of the award’s sixth generation and current Master of Cider, David Sheppy’s grandfather won in the 1930s, which started Sheppy’s on it’s road to becoming one of the most distinguished cider makers in the country. The International Cider Awards will culminate with the medal presentations at London’s Guildhall, where members of the international brewing and cider-making community will come together to discover and celebrate the 2019 trophy winners. A project aimed at educating the next generation about the links between agriculture and where their food comes from has engaged thousands of Cornish primary school children since it began. Organiser of the Royal Cornwall Show, the Royal Cornwall Agricultural Association (RCAA), launched the Farm & Country Days On The Road project at the end of 2017 to further the reach of their educational work. The project centres around a purpose-built trailer kitted out with interactive resources and activities which is taken to local schools to help their pupils aged from 4 - 11 learn about farming and food production. A recent visit to Pencoys Primary School at Four Lanes near Redruth saw the 5000th pupil climb the trailer’s tailgate to participate. Over the past 16 months 61 schools across Cornwall have enjoyed a visit. Education coordinator and former primary school teacher, Emma Parkyn, leads the RCAA’s educational activities and is enjoying enlightening food consumers and farmers of the future with this important knowledge. “We try to make it fun and exciting so the children enjoy finding out more about what farming is all about and they often ask some very interesting questions. “Getting properly stuck in is the order of the day and we have lots of hands on activities to bring everything we do to life, it also fits neatly into various aspects of the national curriculum. The charity began working with schools by setting up and running the popular Farm & Country Days at its Wadebridge showground in 2013. So far more than 7000 seven to nine-year-old children from across the county have attended the annual event. For more information about the project or the RCAA’s educational work please visit www.royalcornwall.co.uk/education or contact Emma Parkyn on 01208 817016 or email: emmaparkyn@royalcornwall.co.uk. Year 1 pupils from Pencoys Primary School join Emma Parkyn, RCAA education coordinator (left) and volunteer Kelly Parsons (right) to celebrate the 5000th Cornish primary school pupil to enjoy the Farm & Country Days On The Road project. “We welcome the limited protections announced today for some areas of the farming industry. However, we should be under no illusion about the consequences of these tariffs coming into force. Under this potential trading regime many of our products will become uncompetitive in Europe, while quotas for global tariff-free imports will create further uncertainty. The Royal Horticultural Society (RHS) Garden Rosemoor in Devon has teamed up with publisher Macmillan Children’s Books for an exciting programme of family fun during the Easter Holidays (6 – 22 April), based on The Rhyming Rabbit, written by Julia Donaldson and illustrated by Lydia Monks. The Rhyming Rabbit is a clever adventure from the picture book partnership of Julia Donaldson and Lydia Monks, creators of What the Ladybird Heard and Sugarlump and the Unicorn. With brilliant rhyming verse, bright and distinctive illustrations, this story is a delight to read aloud. Families can enjoy The Rhyming Rabbit Hop About Trail which will take them around the garden, meeting the Rhyming Rabbit’s animal friends along the way. Youngsters can also take part in craft activities such as the chance to make their very own rabbit headband. Other workshops will help families explore how animals live in the wild and in their gardens, how plants help to sustain them and what they can do to support wildlife of all kinds. Other activities taking place this Easter include: The Golden Carrot hunt when families can solve the clues leading to the location of the Golden Carrot on a map for a chance to win books and RHS prizes. At the start of the school holidays on 6 and 7 April, Rosemoor is hosting a brand new event – Wool & Yarn Fest. This will include a wealth of traders and displays of products from talented local craftspeople as well as a number of demonstrations and workshops using these versatile materials. In addition there will be young alpacas and spring lambs for all the family to meet. On Tuesday 9 and 16 April, The Really Wild Learning Show with Kim Insull returns to Rosemoor with his collection of minibeasts and creatures to get up close with, some of which are laying eggs! This is a ticketed event (plus normal garden admission) and there is limited capacity of 30 children per show priced at £2.50 per child (aged 3yrs and over) and tickets need to be booked in advance to avoid disappointment. For more information and to book tickets, please visit the website rhs.org.uk/rosemoor or phone 01805 626810. With the onset of spring, and as a tribute to our newest restoration project here at Hestercombe, we’re calling for young writers to enter our poetry competition on the theme of ‘spring’. With the unveiling of Sibyl’s Temple, a recreation of a magnificent 18th century building in Hestercombe’s Georgian Landscape garden, winners of the competition will get the chance to read their poem at the official ceremony on Wednesday, 17th April. They will also be invited to take part in a writing masterclass with one of the competition’s judges, international bestselling author Vicky Holmes (creator of Warrior Cats, Rainbow Magic, Animal Ark, Heartland and Chestnut Hill), and there will be prizes of £25 in book tokens to spend on their favourite reads. Alongside Vicky, there will be a number of special guest judges, including Hestercombe’s Chief Executive Philip White MBE. The competition will close at 5pm on 1st April 2019.
t’s only 100 days to go until the Royal Bath & West Show, and livestock entries are now open, with new classes, top judges and plenty of evening entertainment on offer. Reflecting the importance of commercial success, the Show has introduced two new cross-bred cattle classes and increased the number of commercial cattle classes. “Husband and wife team Jason and Sarah Wareham from Sussex will be judging the commercial and young handler categories, with Jason returning to the Show having exhibited here as a boy,” says Mr Lyons. Another regular exhibitor, Richard Dorrell from Worcestershire, will be judging the supreme beef championship, while Peter Waring from East Yorkshire will be picking out the supreme dairy champion. In the sheep section, Portland, Primitive and Shetland sheep now have their own class, and young sheep handlers have an impressive five classes to choose from. “Judging the interbreed pairs championship is Gwynne Davies from Ceredigion – a well-known sheep farmer and the sheep commentator from the Royal Welsh Show,” explains Mr Lyons. Sheep shearing is always a popular draw, with some of the UK’s fastest shearers competing for the top prize. This year the event will host the South West area qualifier for the National Young Farmers Clubs, leading to the final at the Great Yorkshire Show in July. Pig exhibitors won’t be left out either, with a new class for veteran sows to complement the veteran exhibitor prize. Within the Cattle Showmanship competition there is a new discipline for senior competitors in that having judged a class and prepared and shown their animal, they have to set it up and take a ‘Show Standard’ image of it – an important part of displaying livestock to look their best. Join the Royal Bath & West Society for networking and nibbles in celebration of International Women’s Day. Friday 8th March 2019 from 09:30 – 12:00. Debbie Howarth - Commercial Enterprise Manager at The Royal Bath & West Society - "How well do you know the Bath & West Showground?" Catherine Look - Managing Director at Oaktree Parks Ltd & Trustee of The Royal Bath & West Society - "Building on Foundations"
Lisa Cadd - Founder of Fuss Free Foodie - "Inspiring Change - the challenges of cooking & eating well as part of working/family life"
Jen Hunter - Events Manager Fernhill Farm and founder of Fernhill Fibre - "Products with Provenance"
The presenters will share their business stories, the challenges they face and give you ‘top tips’ to take away. This is a great opportunity for business women to connect, share stories and celebrate achievements. Places are limited and are on a first come first serve basis. The proposed new body for overseeing environmental legislation must be truly independent if farmers and land managers are to have confidence in it, the Agricultural Law Association has warned. In its response to the draft Environment (Governance & Principles) Bill, the ALA is clear that the new Office for Environmental Protection (OEP) should report directly to Parliament, not just to Government departments. “As an independent body, the OEP will be giving advice on proposed changes to environmental law, but under the current wording of the draft Bill the Minister won’t be required to present this advice to Parliament, which has the real possibility of limiting the scrutiny of any future changes,” said Mike Holland, consultant and adviser at the ALA. In addition, the ALA recommends that the OEP has an internal panel with legally qualified members to deal with any authority which fails to comply with environmental law or issues arising from misinterpretation of Government policy. “This panel should have the power to set up a judicial inquiry, to ensure policy implementation is robust,” explained Mr Holland. This is particularly important with regard to new regulatory baselines that will apply to the environment; the starting point for the Government’s 25-Year Environment Plan. “While baseline data will be used to measure the success of environmental schemes, it’s not clear how the data will be collected or used, or how those baselines will be established,” said Mr Holland. “It is fundamental to the agriculture sector that the Government is clear on the evaluation methods that will be used and supported at farm level. For more information visit www.ala.org.uk. The Royal Horticultural Society (RHS) Garden Rosemoor, in North Devon, has signed a local three-year sponsorship deal with Atkins Ferrie Wealth Management (AFWM). This follows on from the very successful partnership supporting the 2018 Rosemoor Garden Flower Show. The deal means that AFWM will be the Headline Sponsor for the next three years at the annual Garden Flower Show in August – the only official RHS Flower Show in the South West. It will bring in valuable funds to increase the content of the show and improve the visitor experience even more than in previous years. The deal also includes support for four other major gardening events in 2019 at Rosemoor, starting with The Spring Flower Festival, 16 & 17 March, then the RHS National Rhododendron Show, 27 & 28 April, followed by Rose Weekend, 21 - 23 June, and finally the Apple Festival in October. The 2019 Rosemoor Garden Flower Show takes place 16 – 18 August and is included in normal garden admission which is free for RHS members. Please visit www.rhs.org.uk/gardens/rosemoor/whatson or call 01805 626810 for more details. Bruton, Somerset, 28th January 2018 – Wyke Farms, the UK’s largest independent cheese producers and exporters, have been granted planning permission to re-build their Bruton based Dairy, doubling the capacity. The redevelopment is part of the companies 5-year plan for growth which is underpinned by increasing volume and the strategic targeting of specific regions world-wide. The company have concluded their market prioritization research; the results of which have been used to develop the Wyke Farms 5-year plan for growth, which includes increasing brand presence in export markets in preparation for post Brexit trade and launching new export targeted products throughout 2019. The companies’ audited accounts for y/e March 2018 show that turnover has risen to a record breaking high of £85 million; a significant 26% increase from the previous year with significant investment into world markets and a growth plan aimed to push the business to a £100million turnover this financial year. The Somerset based company have seen strong and consistent sales growth in the UK and overseas despite the challenging retail landscape. The new Dairy expansion project, titled ‘Ivy’s Dairy’ after Wyke Farms’ matriarch Ivy Clothier will create a 16,589m² state of the art production facility. The dairy will be built to Ivy Clothier’s founding principles of producing the best in class quality combined with an industry leading respect for the environment. The development will be both energy and water efficient and sympathetic to the surrounding environment, with soft landscaping and a natural grass roof. The investment will build a sustainable long-term future and build sufficient infrastructure for servicing increased sales of award winning cheddar in both the UK and export markets. Wyke Farms has been producing its award-winning cheddar to their secret family recipe for over 150 years and has grown to become one of the largest family-owned cheese makers in Britain selling over 15,000 tonnes annually to over 160 countries around the world. 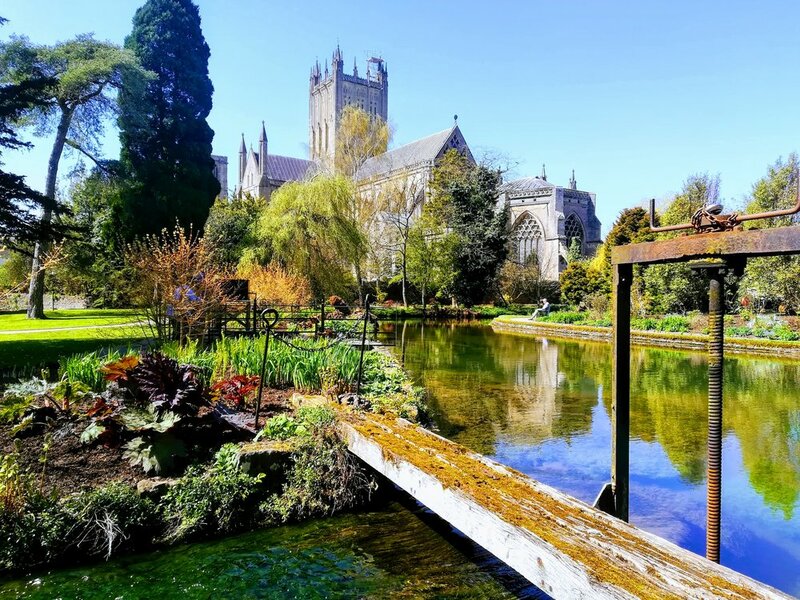 If you’re looking to keep little ones busy this Easter Holiday, why not head over to The Bishop’s Palace & Gardens in Wells to join in with a whole range of family-friendly activities with a variety of Easter themes. The holiday fun kicks off on Saturday 6th April when the new Easter Egg Trail will be in place. Challenge the kids to follow the clues around the Palace & Gardens and find coloured eggs hidden in unexpected places – and if they find them all, they can claim a chocolate prize from the Visitor Centre on the way out! On Tuesday 9th and 16th April (10:30am-3pm), our Crafty Cats sessions will take place in the Undercroft of the Palace. On 9th the theme will be ‘Bugs and Buds’ and the children will have the chance to create Bug Hand Puppets, Coffee Filter Butterflies and Tree Blossom Picture, and on 16th the Easter-themed activities will include making Bunny Masks, weaving Easter baskets and creating Easter Egg Mosaics! On Thursday 11th and 18th April (11am-3pm), the Palace Garden team will be holding “Nature Ninjas” activity sessions in the Community Garden, aimed at getting little ones engaged with nature and gardening. The team will have lots of horticulturally-based fun activities for all ages. For something a little different, join Raptorcare on Saturday 13th April for the Palace’s Medieval Falconry Day. Taking place from 10am-4pm, Tony, the master falconer, will be hosting flying displays, suitable for all ages, on the South Lawn. The displays will illustrate how these birds would have been used in Medieval times and why. Marvel at their skill and training as they show off their well-honed moves in front of the audience and in between displays, visitors will also have the chance to handle some of the birds. The 14 acres of Gardens will be open daily throughout the Easter Holidays and the Dragon’s Lair Play Area is the perfect place to exercise little legs – climb the Dragon’s Wings, explore the Tree Pods, crawl through the Dragon’s belly or pump the water to spill the bucket and send the Dragon to sleep – the choice is yours! There’s also a choice of The Hungry Dragon Snack Bar (adjacent to The Dragon’s Lair), serving drinks and snacks, or The Bishop’s Table Café, which is open daily, serving child-friendly menus alongside lunches, cakes and hot drinks to refresh the grown ups too! All activities are included in standard admission. The Devon County Agricultural Association (DCAA) has announced the launch of The Prince of Wales Award 2019. The Award, which the DCAA has run for 34 years, is open to Devon-based community projects. Entries are encouraged from all areas of the community, from schools through to small farm diversification projects. The emphasis, reflecting HRH the Prince of Wales’ personal beliefs, is on sustainability and young people. Entries are judged by a panel from the DCAA and the winner is selected based on their outstanding contribution. Winners receive a cheque for £1000 and must invest their prize in further community projects. Entries are now available to download from the website at www.devoncountyshow.co.uik. Entry deadline is March 29th 2019. The winner will be presented with their prize at Devon County Show 2019 on Friday 17th May. 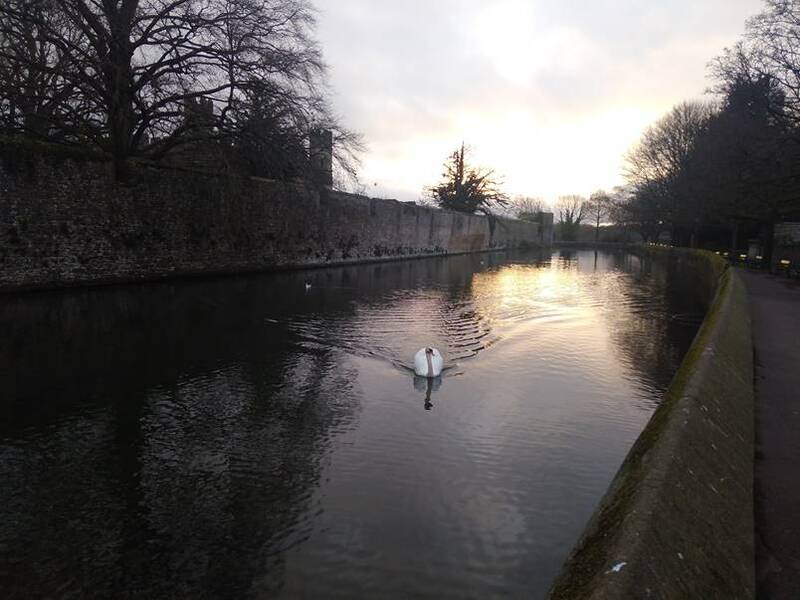 Exciting news on The Bishop’s Palace Moat in Wells this morning as a lone swan has been spotted swimming happily around. Palace staff spotted the animal early this morning and believe it to by Wynn, the widowed Palace Swan who was last seen on 18th October 2018 when she took leave of the moat with her remining four cygnets. It is thought that she has been living on the Somerset Levels with her juveniles, but that as they will now have started living independent adult lives, she has returned to her former home. Wynn was the recipient of much media attention earlier this year when she was left widowed by the death of her life-partner Brynn whilst she was nesting. She battled on bravely and hatched 5 beautiful cygnets in May which she successfully reared to adulthood. Wynn seemed happy to be back on the moat, happily feeding from Visitor Operations Team member Jane Lawrence’s hand this morning! Palace Staff are hopeful that Wynn will choose to return to her picturesque home full time but are also holding out hope that she might entice a new partner to share her home and breed some more cygnets. Wynn and former life partner Bryn had lived at the Palace since 2013 when they travelled from Wales to take up residence in Wells. Wynn had successfully reared 45 cygnets since living at the Palace, and the swans and their cygnets have been an extremely well-loved feature of the Palace Moat, with tourists waiting to see the Gatehouse bell rung when the swans are hungry. The tradition began in the 1850’s, when Bishop Eden’s daughter Maria, taught a pair of swans to ring a bell on the Gatehouse when they wanted to be fed. If you’re a fan of the stunning heritage in medieval Wells, from now on you can get more for less with the newly launched Wells Heritage Pass. Wells’ newest collaboration sees three of the major players in the city’s tourism economy working together for the very first time. Wells Cathedral, The Bishop’s Palace and Wells & Mendip Museum have joined up to offer residents and visitors the chance to enjoy unlimited access to these three historically significant sites all year round with one annual pass. The Bishop’s Palace and Wells Cathedral already have annual pass schemes in place, allowing holders to visit as many times as they wish all year round, but the new Wells Heritage Pass offers a significant discount on these and adds in the wonderful Wells & Mendip Museum, which has an annual programme of exhibitions, workshops and talks to keep visitors wanting to come back throughout the year. The Wells Heritage Pass starts at £40 for an individual, and also offers Joint and Family options. If you’re struggling to find a gift for someone who has everything this Christmas, the gift of 12 months of Wells Heritage could be your perfect present! All funds raised from the Wells Heritage Pass will be invested in the conservation of these significant heritage landmarks and will ensure that the doors of these sites are kept open to the public now and for future generations. To find out more and to purchase, visit The Bishop’s Palace Shop, or the Wells Cathedral Donations Desk and Shop.